U.S. Indicts 14 In FIFA Corruption Inquiry : The Two-Way Seven officials were arrested in Switzerland. "This really is the World Cup of fraud," says Richard Weber, chief of the IRS' Criminal Investigation unit, "and today we are issuing FIFA a red card." The FIFA headquarters in Zurich, Switzerland. On Wednesday, Swiss police raided a Zurich hotel to detain top FIFA officials as part of a U.S. investigation into corruption. Arrest and search warrants have been executed against senior FIFA officials and several executives for what the Justice Department says was a corrupt scheme that gleaned "well over $150 million in bribes and kickbacks" over the course of 24 years. The department announced that it has indicted 14 people from the U.S. and South America — including nine senior officials with FIFA, soccer's international governing body. Seven of the FIFA officials were arrested in Switzerland early Wednesday. "This really is the World Cup of fraud," says Richard Weber, chief of the IRS' Criminal Investigation unit, "and today we are issuing FIFA a red card." Acting upon a U.S. request, Swiss police apprehended the seven FIFA officials at the Baur au Lac, a luxury hotel on Lake Zurich where they had gathered ahead of FIFA's pending presidential election. Of the nine officials who were indicted, two of them are FIFA vice presidents. Charges in the 47-count indictment include bribery, racketeering, money laundering and wire fraud. Five corporate executives were also indicted. FIFA says it has provisionally banned those who were named in the charges. Nearly all of the charges center on tournaments and other activities that took place in the U.S. and South America. The bribes allegedly influenced the awarding of media and marketing rights to international tournaments. U.S. Attorney General Loretta Lynch also says U.S. investigators linked both the 2010 World Cup in South Africa and the 2011 FIFA presidential election to corruption. A sponsorship deal between Brazil's national soccer team and "a major U.S. sportswear company" was also tied to bribery, the attorney general says. Also Wednesday morning, Swiss federal prosecutors said they had opened an investigation into the bidding process for the 2018 and 2022 World Cups, which were awarded to Russia and Qatar, respectively. But FIFA is reiterating that it would not consider moving those tournaments. Breaking a silence that had drawn speculation and criticism as it lingered, FIFA President Sepp Blatter says that while the events are "unfortunate," FIFA is taking steps to root out corruption, and "we welcome the actions and the investigations by the U.S. and Swiss authorities." He added: "such misconduct has no place in football and we will ensure that those who engage in it are put out of the game. Following the events of today, the independent Ethics Committee... took swift action to provisionally ban those individuals named by the authorities from any football-related activities at the national and international level." Calling it a difficult time for soccer, Blatter said, "We understand the disappointment that many have expressed." Announcing the charges, U.S. Attorney General Loretta Lynch says the accused officials "corrupted the business of worldwide soccer" to enrich themselves. At a mid-morning news conference in New York, Lynch said that "beginning in 1991, two generations of soccer officials" in the U.S. and South America used positions of trust to obtain money in return for help in securing marketing and media rights and other favors. Lynch said federal agents are executing search warrants at CONCACAF offices in Miami today. And she said the federal investigation found that the Copa America tournament, which is set to be played in the United States next year for the first time, was also the center of bribes. She stated that the money involved was found to be "$110 million — nearly a third of the legitimate costs" for several years' worth of rights to the tournament. 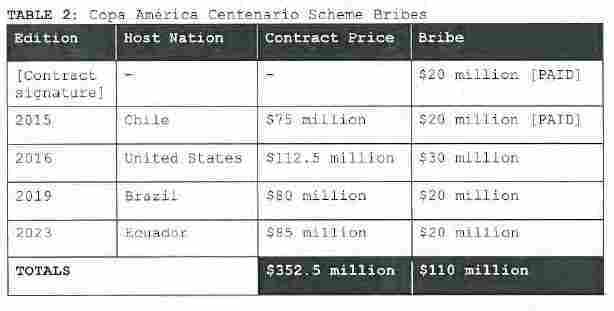 A table included in the U.S. indictment shows several years' worth of bribes centering on the Copa America tournament. Lynch noted that a former CONCACAF president who ostensibly served without pay actually received some $10 million in bribes. "Jeffrey Webb and Jack Warner — the current and former presidents of CONCACAF, the continental confederation under FIFA headquartered in the United States — are among the soccer officials charged with racketeering and bribery offenses," the U.S. Justice Department said earlier today. The seven people arrested today are among nine senior FIFA officials — including two of the group's current vice presidents — the U.S. has indicted. Charges in the 47-count indictment include bribery, racketeering, money laundering, and wire fraud. Five U.S. and South American corporate executives were also indicted. "It spans at least two generations of soccer officials who, as alleged, have abused their positions of trust to acquire millions of dollars in bribes and kickbacks. And it has profoundly harmed a multitude of victims, from the youth leagues and developing countries that should benefit from the revenue generated by the commercial rights these organizations hold, to the fans at home and throughout the world whose support for the game makes those rights valuable." The U.S. attorney's charges were first reported by The New York Times. At a news conference today, FIFA spokesman Walter De Gregorio said the organization's president, Sepp Blatter of Switzerland, was not a target of the investigations and that Friday's election for FIFA president would go ahead as scheduled. Blatter is being challenged by Jordanian Prince Ali Bin al-Hussein. The U.S. is requesting the extradition of the seven officials. Swiss authorities said the detainees will be questioned Wednesday and have the right to contest their extradition. In addition to the 14 people indicted in the U.S. case, an additional four individuals and two corporations had earlier pleaded guilty under seal. In those arrangements, at least three people each forfeited more than $1 million — including one, Brazilian sports executive José Hawilla, who agreed to hand over $151 million. "The bribery suspects — representatives of sports media and sports promotion firms — are alleged to have been involved in schemes to make payments to the soccer functionaries — delegates of FIFA (Fédération Internationale de Football Association) and other functionaries of FIFA sub-organizations — totaling more than USD 100 million. In return, it is believed that they received media, marketing, and sponsorship rights in connection with soccer tournaments in Latin America. According to the US request, these crimes were agreed and prepared in the US, and payments were carried out via US banks." 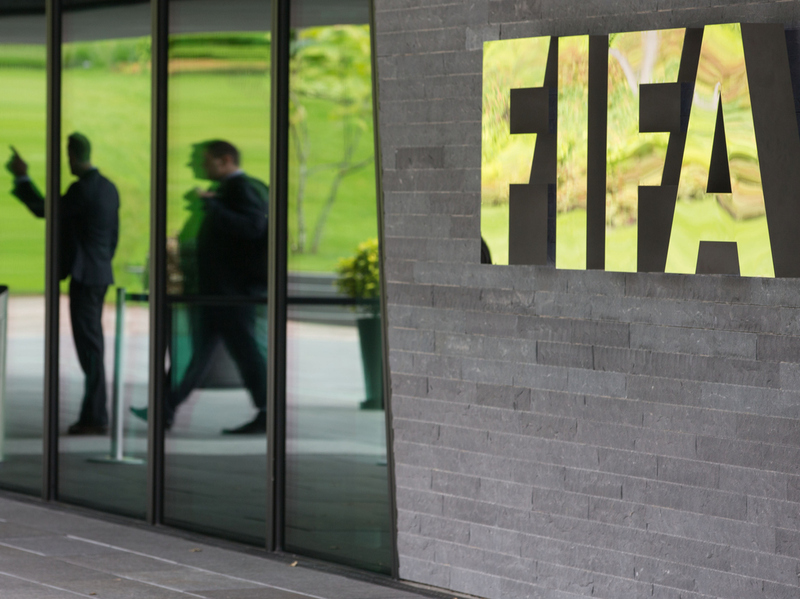 In the investigation concerning Russia and Qatar, Swiss authorities raided FIFA's headquarters early this morning, seizing electronic data and documents. Swiss prosecutors said they will interview 10 FIFA executive committee members who took part in the votes to award the World Cup to Russia and Qatar. FIFA spokesman De Gregorio said FIFA had gone to Swiss authorities in November with concerns that the bidding process was corrupt. "This is the consequences of what we initiated," said De Gregorio. "So it's a surprise that it happened today, but it's not a surprise that it happened. "We cannot investigate as the police can or a general prosecutor can. So that's the reason why we did it and that's the reason why we fully cooperate." FIFA governs the world's most popular sport. The multibillion-dollar organization has been accused of bribery and corruption for decades. Traffic Sports USA Inc. and Traffic Sports International Inc.